My 2-year-old grandson, Owen, just loves Sesame Street. His absolute favorite character is Elmo, or "Melmo," as Owen calls him. He has Elmo stuffed characters, Elmo books, Elmo pajamas, Elmo toys and even an Elmo potty seat! 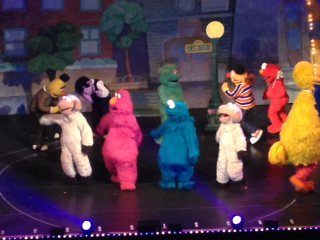 Given his devotion to Elmo, I decided that a trip to see Sesame Street Live at Star Plaza Theatre would be the perfect birthday gift for my special little guy. Boy, was I right! We headed to the theatre for the Friday morning show, which was the day after Owen&apos;s second birthday. We had fantastic seats in the mezzanine - I don&apos;t think that there&apos;s a bad seat in the whole place! It had been several years since I visited Star Plaza Theatre and I had forgotten what a fabulous place it is to watch a show. Owen loves excitement and other little kids, so when we got to our seats, he wanted to go find someone to play with. He didn&apos;t really understand what was going on until the curtains opened and he saw Elmo and the rest the Sesame Street characters. He was awestruck and looked at his mom. "Melmo!!" he said excitedly. He was fascinated! His eyes were glued to the stage as the brightly colored and lively Sesame Street characters sang and danced to familiar songs. The show amused even the adults in our group, although watching Owen&apos;s reactions was pretty fun, too! He loved the upbeat music and was dancing in his seat and bobbing his head to the beat. Every time Elmo would leave the stage, Owen would turn to me and in his sweet little toddler voice ask, "Where&apos;d he go?" During intermission, Owen and I headed downstairs for a blue snow cone and a T-shirt (Elmo, of course!). 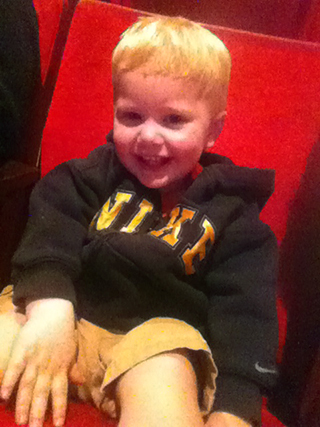 I was delighted with a sweet little boy who shared his popcorn with Owen while we were waiting in line. We enjoyed the show thoroughly and were sad to see it end. I&apos;m so glad I decided to do this for Owen&apos;s birthday - the memories we made are priceless!